Powers/Abilities: The Warlord had access to the advanced equipment of Other Earth, as rebuilt by Nathaniel Richards. 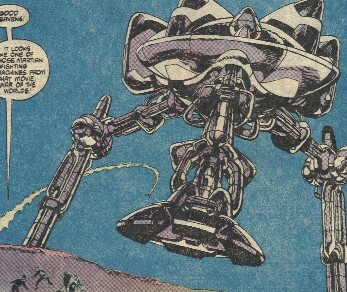 This included the Striders, an anti-matter cannon, an illusion projector, and much more. Cassandra was a fierce, belligerent woman with world-conquering aspirations, who was more than willing to have her servants tortured for failure, even if it was not their faults. She was able to put on the pretense of being a gentle, loving wife, fooling Nathaniel for several years. 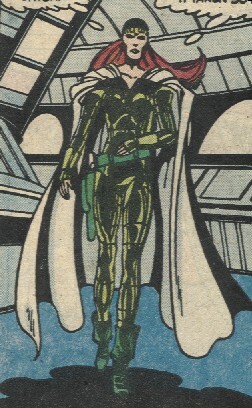 (Fantastic Four I#273 (fb) - BTS) - Cassandra was the youngest daughter of the leader of the women of the Eyrie, a sect who had come into being some time after the war between Earth and the Lunar colony, which had resulted in the destruction of the moon and a period of great environmental disaster on Earth. Eventually, Nathaniel Richards--who had been trying to travel forward in time--transported himself from Earth-616 to Other Earth. Proclaiming himself to be a peaceful scientist, Richards explored Other Earth, eventually finding and befriending the women of Eyre. (Fantastic Four I#273 (fb)) - After a year of working with the women warriors and earning their trust, their ruler cemented their relationship, binding Richards to her family via a ceremonial marriage to her youngest daughter, Cassandra, after the custom of her people. Richards designed the sky-steeds for the women warriors and led them on a crusade to restore scientific advancement and civilization to the fragmented archipelagoes of Earth. Discovering a facility that had survived the devastation mostly intact, Nathaniel and Cassandra made their base there and began to restore the machinery. The rest of the warrior women were sent off to continue their grand crusade. (Fantastic Four I#273 (fb) - BTS) - While Richards lost himself in scientific discovery and repair, Cassandra's thoughts drifted to the power she could achieve with the technology they had. Posing as a loving wife, Cassandra bore Nathaniel a son, but all the while she manipulated his discoveries to set herself as the Warlord. Using the illusion that the Warlord was actually Nathaniel, Cassandra savagely struck down one of the townsites nearby to their fortress. As the Warlord, she declared herself ruler of the entire planet, and had shown in her attack that she had the power to make good this declaration. (Fantastic Four I#272) - When the Fantastic Four traveled to Other Earth in search of Nathaniel, they were attacked by one of the Warlord's Striders, which they destroyed. This earned them the wrath of Cassandra, who commanded her primitive servants to send a squadron of Striders to intercept them if they approached the Fortress. She then changed into her humble garments and begged a word of her loving husband. (Fantastic Four I#273) - When the FF destroyed another Strider, Cassandra threatened to send her servants to the rack-master. 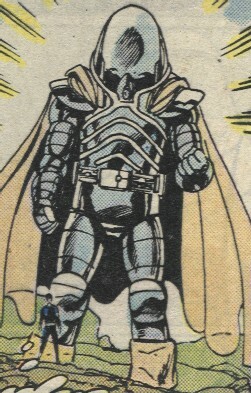 After coming to suspect that his father was the Warlord, Reed approached the Fortress, and was confronted by an immense image of the Warlord. Reed tried to get "his father" to listen to him, revealing his true name and appealing to the man he once knew. In response, the Warlord sent a squadron of Striders and aircraft to attack the Fantastic Four, the women warriors, and Colby and his posse. 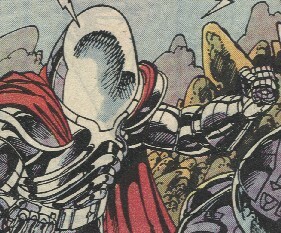 As the high power battle continued, Wyatt Wingfoot climbed around a small hill where he saw the Warlord preparing to fire an anti-matter cannon at her foes. Wyatt hurled a rock into the cannon just as it was fired, and the partially contained explosion killed the Warlord and those beside her. Reed was soon reunited with his father, who confessed that his love for his wife and his focus on the technological rebuilding had blinded him to her tyrannical acts and behavior. Nathaniel decided to stay on Other Earth, to guide his son to a better future. Quick background on Other Earth: It diverged from Earth-616 by the simple fact that the Dark Ages never occurred. That means science continued a rapid progression of scientific discovery without the break from 300 - 1300 AD. 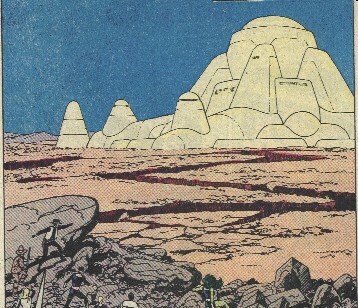 Natives of Other Earth landed on the moon about 1100 years before they did so on Earth-616. The modern calendar on Other Earth begins from the point they landed on Earth, and 1127 was roughly equal to the middle of the modern era on Earth-616. This is the same reality in which Nathaniel Richards II (not Reed's dad) became Kang @ their year 3000. Anyone able to come up with a better name for the women warriors of the Eyrie? The Valkyrior of Other Earth just keep popping into my head b/c She-Hulk commented on the Ride of the Valkyrie as they flew in. They certainly had a Norse or Viking feel about them, and they flew atop robotic pteradon-types. I'm going with the Eyriennes. 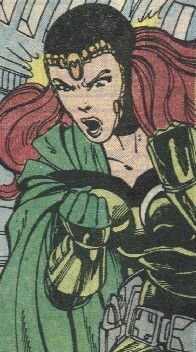 Interestingly, about 100 issues later, in FF#377, Huntara was introduced. Initially, it was to seem that Huntara was the daughter of Nathaniel and Cassandra Richards (or at least that's how it seemed to me). Later, that was called into question, but it remains unconfirmed. What it most interesting is that the only child seen or mentioned in FF#272 and 273 was the SON of Nathaniel and Cassandra. As Cassandra died in those issues, they would not have seemed to have a daughter at all. Cassandra and Nathaniel had another child, a daughter, either older or younger than their son...or perhaps Nathaniel had her genetic material banked and used it to make a daughter at a later date. Huntara is the granddaughter of Nathaniel and Cassandra, and the daughter of their son. Their child was mistakenly referred to as a son, when it was actually a daughter, or the child had a little snip-snip, tuck-tuck, wrap-wrap done. Huntara is not actually related to Nathaniel and Cassandra, but really Mary Alvarez as hinted at in later issues. I like options #1 or #2, myself. He was was believed by most to have been the Warlord until Cassandra's death. She even adopted his armor to facilitate that deception. or others going by the title of Warlord. 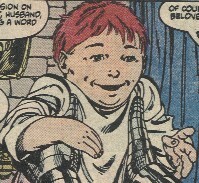 The child of Cassandra and Nathaniel, he may even be the ancestor of Kang the Conqueror. One of the "old places"--a structure that had survived almost intact from the lost years before the lunar war, it existed on one of the large islands created when the moon fragments crashed down into Earth. Nathaniel was delighted and began work to restore the old machines. As he worked to do just that, Cassandra used the technology to establish herself as the Warlord. Immense tripods rebuilt from the old technology by Nathaniel Richards, they looked to be nearly 100' tall, could fire lasers, extend pincers, carbonize the air in small regions to put out flames, travel across distances, and perform surveillance and destruction missions. They were piloted by some of the primitives, who wore psycho-neuro stimulators that raised their intelligence levels. One of the Striders stomped on the She-Hulk and carbonized the Torch, but Jenny incapacitated it from within. Prepared for this assault, Johnny distracted the pilots of the next Strider with flame duplicates, then incapacitated the command center. The Warlord later sent a whole squadron of Striders after them, but they were fought off with the aid of the women warriors of Eyre and Colby's posse.